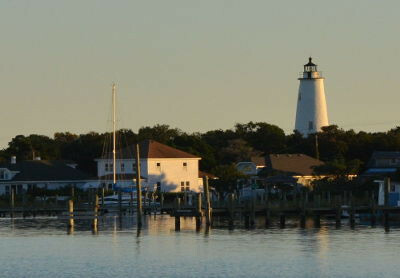 Ocracoke Island is one of several islands and peninsulas that make up North Carolina’s Outer Banks. As the southern-most portion of the Cape Hatteras National Seashore, most of the island is owned by the United States National Park Service. Only about two square miles near the southern end of the island is privately owned. Accessible only by ferry, airplane, or private boat, Ocracoke is the most isolated portion the Outer Banks. With sixteen miles of pristine beaches, many recreational opportunities, a wide variety of shopping and dining establishments, and friendly locals, Ocracoke attracts visitors from around the country and the world. The European history of the island begins on November 11, 1719 when John Lovick, Secretary of the Colony of North Carolina and a Deputy of the Lords Proprietors, was granted the island of Ocracoke, containing 2,110 acres. During the early eighteenth century, Ocracoke was used chiefly for raising cattle and sheep. Because larger vessels were unable to navigate the shallow Pamlico Sound, Ocracoke Island soon became a settlement for pilots who transported sought-after goods to ports on the North Carolina mainland. Pirates have long been a part of Ocracoke history. Blackbeard was killed here in a naval battle on November 22, 1718. Buccaneers continued to use the island as a temporary campsite even after the infamous pirate’s death. On July 30, 1759 William Howard, of the Province of North Carolina, bought Ocracoke Island for £105. He was the first owner to make his home on the island, and may be the same William Howard who served as quartermaster to Blackbeard earlier in that century. Many of William Howard’s descendants have continued to live on the island to this day. Over the next two hundred years Ocracoke prospered and grew. Located near the southern end of the island, and nestled around one of the most beautiful natural harbors in the new country, Ocracoke village attracted sailors, pilots, and commercial fishermen. Eventually, as sturdier homes were built and more families were raised on this isolated ribbon of sand, stores, churches, and a school were established. Today the year-round population numbers about 750. Throughout its history Ocracoke and its people have been witnesses to a number of important events. Ocracoke Inlet, with its deep and navigable channel, was a strategic point of entry into Pamlico Sound and ultimately to mainland North Carolina during both the Revolutionary and Civil Wars. During the War Between the States, local residents served proudly in both the Union and Confederate armies. Fort Ocracoke, on nearby Beacon Island, was the scene of a naval attack in 1861. The fortress was abandoned during that time, and later destroyed. Recently, marine archaeologists have uncovered numerous artifacts in the vicinity. World War II saw the construction of a naval base on Silver Lake Harbor and the erection of the first radar tower near the beach on what is now known as “Loop Shack Hill.” The war was closer to our shores than many Americans realized. Throughout the conflict local residents reported seeing numerous ships burning off-shore as the result of aggressive U-boat activity. The British Cemetery, next to the historic Howard family graveyard, is the final resting place of four sailors from HMS Bedfordshire, an armed trawler, which was torpedoed on May 11, 1942. Island residents discovered their bodies on the beach shortly after the tragedy and arranged for a fitting burial under the shade of several ancient live oak trees. Today the graves are under the care of the Graveyard of the Atlantic Museum, the Commonwealth War Graves Commission, and the US Coast Guard. Every spring, a memorial service is held to honor these and other brave sailors who served in WWII.